Providing you the best range of stainless steel pipes for food industry with effective & timely delivery. Known in the industry as a prominent supplier and retailer, we are engaged in offering Stainless Steel Pipes For Food Industry. Stainless steel pipes for food industry are well constructed, corrosion resistant, cost effective, leak proof and rust free as well. High compressive strength, longer service life, fine finishing and high heat resistance are key characteristics of stainless steel pipes for food industry which are also available in varying array of lengths. 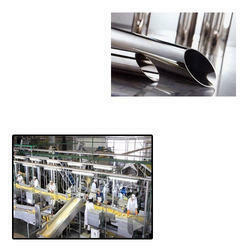 Looking for Stainless Steel Pipes for Food Industry ?